Buy Doves Farm gluten free quick yeast 125g in the UK from our online shop or directly from our independent Scottish store. For all bread baking and ideal for bread machines. There is enough yeast in this pack for a variety of breads and yeast cookery. You can make this seasonal pizza recipe in Summer or Winter as kale is in season in both months. This recipe contains 1/2 tsp yeast. Where can you buy real Quick Yeast - gluten free safely online? If you are wondering where you can buy Doves Farm gluten free quick yeast 125g safely online in the UK, then shop with us. 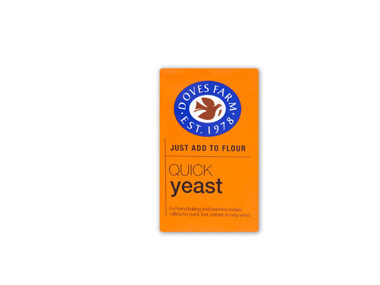 Quick Yeast - gluten free - Doves Farm gluten free quick yeast 125g in Baking Sundries and Baking.